The Government will soon provide more national direction on managing risks associated with natural hazards through a National Disaster Resilience Strategy. The National Disaster Resilience Strategy is being developed by the Ministry of Civil Defence & Emergency Management (MCDEM), and will replace the current National Civil Defence Emergency Management Strategy. The MCDEM website states the Ministry will consider where efforts could be better targeted to yield the greatest benefit across the four priority areas of the Sendai Framework (listed above). 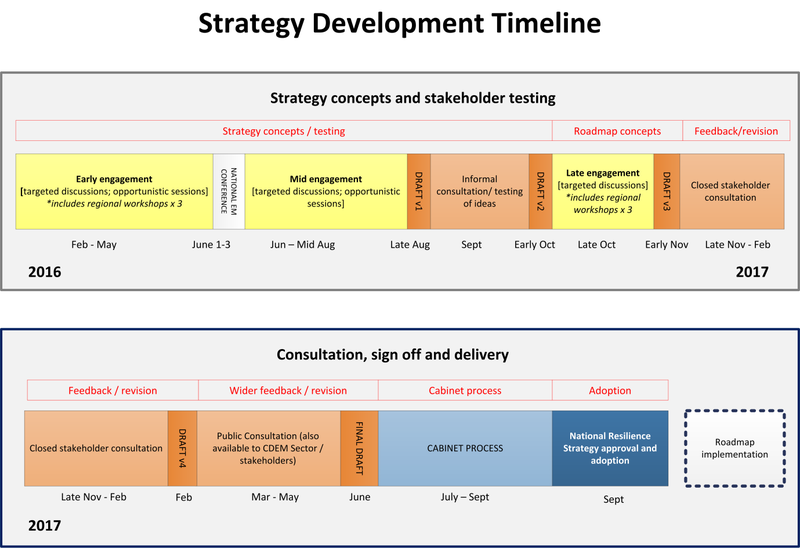 Strategy development processCouncils are key stakeholders in the National Disaster Resilience Strategy, alongside property managers and owners, lifeline utilities, insurers and reinsurers, and the NZ Insurance Council. There are multiple opportunities for local government to take part in the MCDEM’s development of the National Disaster Resililence Strategy, which is due for completion in 2017 – the timeline for that process is available here. National Policy Statement or National Environmental Standard?At a recent Resource Management Law Association meeting, Tonkin + Taylor Director Marje Russ said one of the outcomes of the Strategy is likely to be national guidance on resilience for councils in the form of a National Policy Statement (NPS) or a National Environmental Standard (NES). Marje is currently working on a report for the Government on this topic. Marje said the resilience NPS or NES is unlikely to be developed until after the Resource Legislation Amendment Bill 2015 has taken effect, so the upcoming changes related to national instruments can apply to that process. At the Resource Management Law Association meeting I attended in Nelson (on 28 April 2016), the indication from participants was that a National Environmental Standard for managing natural hazards would be more welcome than a National Policy Statement. The general view was that a NES would more effectively and efficiently overcome many of the difficulties many councils have faced when the community has opposed natural hazard mapping and rules in resource management plans. Do you agree? Or do you think a National Policy Statement would provide what councils need to manage natural hazards in New Zealand?